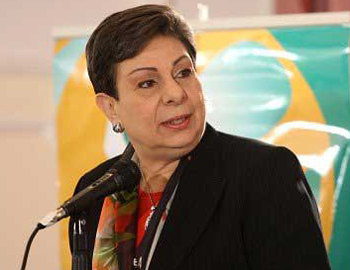 PLO Executive Committee Member Dr. Hanan Ashrawi strongly condemned a recent demand, by Israeli Prime Minister Benjamin Netanyahu, to shut down the United Nations Relief and Works Agency for Palestine Refugees in the Near East (UNRWA). “Netanyahu’s call to disband UNRWA is the epitome of arrogance, particularly since Israel itself is responsible for creating the Palestinian refugee problem,” Said Ashrawi in a press statement issued on Thursday. The statement said, according to WAFA, that the Israeli government bears a moral and legal responsibility for Palestinian refugees and the serious injustices of the past. UNRWA has also given the refugees a sense of hope and contributed effectively to regional stability, Ashrawi stated. “Any developments that endanger the existence of UNRWA and its mandate threaten to destabilize the whole region, she stressed. “It is high time that the plight of the Palestinian refugees is recognized by the international community and resolved in accordance with international law and conventions, particularly by implementing UNGA resolution 194. Until then, it is crucial that UNRWA remains in operation to fulfill its mandate,” the release concluded. UNRWA is a United Nations institution established by UNGA Resolution 302 (IV) of 8 December 1949 to carry out direct relief and works programs for Palestinian refugees. Israel should not be allowed to dictate how to change the legal system and to persist with its unlawful unilateralism. Prime Minister Benjamin Netanyahu called for UNRWA to be dismantled on Sunday, accusing it of incitement against the Jewish state.